Transfer in Bayview, located at 101 W. Mitchell Street, is one of favorite places to go. That’s not to say we go there often, though, as we have come to realize, we have a lot of favorite places! However, TJ and I both really like their pizza (and that’s a lot for me to say). Besides great pizza, they just have a great menu – this includes their booze. This particular afternoon, we stopped in for a quick snack to last us from lunch to dinner. Since it was the primetime, I opted for the Bloody Mary. Why not? The chalkboard wall said Bloody Marys were $5 on Sundays but I wanted the DaVinci listed on the menu. Of course, it was not on special. Mix: The mix was certainly different and not in a bad way! I saw the bartender scoop spices into my glass before filling the glass with tomato juice. I didn’t take a picture of the menu and I can’t find the write-up description on their website but I’m going to put my brain to work and say this was a pizza-themed Bloody. How clever, right? The thin tomato juice was mixed heavily with green herbs I mustered up to be basil and maybe some parsley. I didn’t taste much garlic or spice but that’s okay! The herbs in this one were very powerful. Garnish: The bartender admitted he typically doesn’t work during the day and that he crafted the toppings by himself so I’m not really sure if they were consistent. He included a pickle spear, a cheese stick, feta cheese stuffed olive, a pepperoncini and a green olive. He didn’t even mess around with the lemon and lime (which I not-so-secretly appreciate). Chaser: I opted for the chaser although it is not included in the price. I let him pick it for me and presented me with a Lakefront Brewery Riverwest Stein. Buzz: I did catch a little buzz at Transfer! I didn’t even have an empty belly! Cost: The cost of the DaVinci was $7. It was very good and well worth the cost. 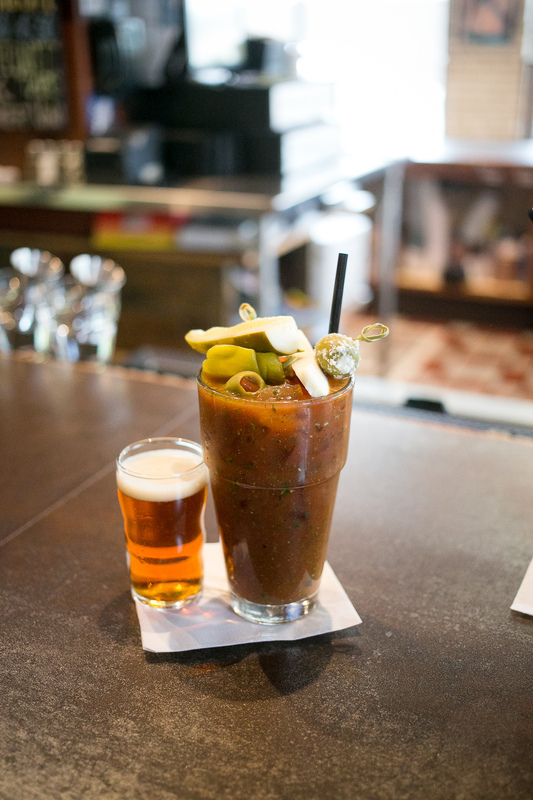 This entry was posted on May 16, 2014 by Shannon in Bloody Marys in the area and tagged Bayview, Bloody, Bloody Mary, Bloody Mary in Milwaukee, Lakefront Brewery, Riverwest Stein, Transfer, Via.